A couple of years ago, I went back and scanned all my favorite photos starting when Alec was born so I can easily find and enjoy them. Here they are at one and three. This was not a happy year for us since their dad had just died in September. I can barely remember that time, so I'm glad I have the photos. 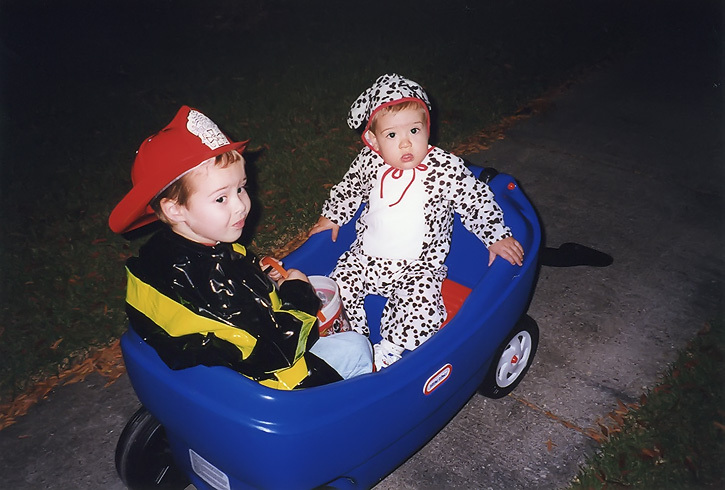 They sure were cute as a fireman and dalmatian. In 2001 I attempted to be crafty after seeing the instructions in Martha Stewart Living for making robots. I am not crafty and I don't enjoy crafts, but I admit the robots were kind of fun to make and they were a big hit! I'm looking forward to passing out candy and seeing all the cute costumes in the neighborhood this year! HOW CUTE!!!! You know I love that fireman!! Cute costumes! Time goes so fast. Happy Halloween!! Could those robots be any cuter! These are precious, what great memories! I've only gone trick or treating once! These are just adorable. Our oldest was a robot one year too with the dryer vent arms and legs. Kind of made me nostalgic for our past Halloweens. what cute little faces and sweet memories! beautiful costumes, too. this was so fun to see them when they were little!!! I love these, Deb! And your robots were awesome :) I am going to try to find the photo of me as a robot when I was little... It was a favorite costume for me! My girls are only 4 & 6, but when ever I look back on their baby pictures I cry..lol It's amazing how fast they grow up. Lovely picture memories, I love the Robots, very crafty!! awwww I love flashback photos like these! These are precious! I need to go back and scan the pics of our son (who's 14 now!) so I can have them like this! It's weird not having a youngster to take around the neighborhood at Halloween - isn't it?! 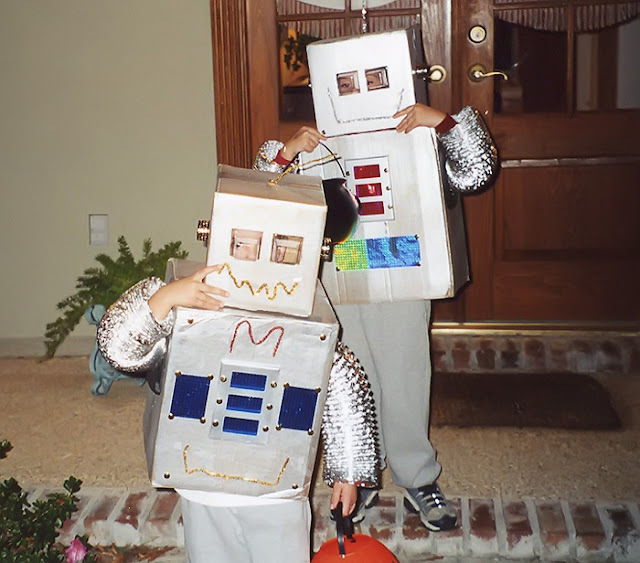 I made my boys the robot costumes too. Must be a rite of mothering passage! Awe your boys are sooo cute. It's great to look back at pictures over the years isn't it? Awwwe! How wonderful you have all of these! 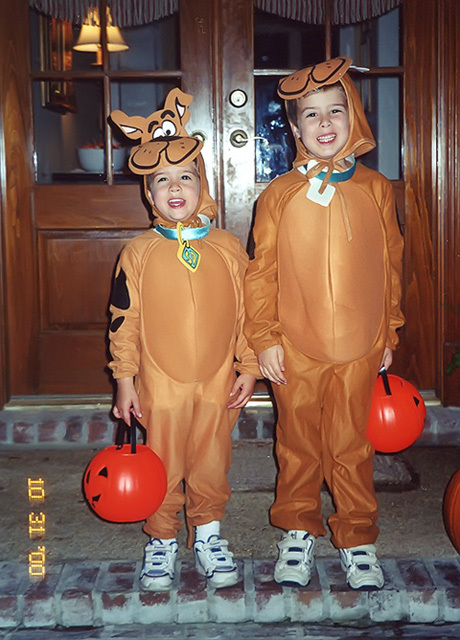 And those Scooby Doo costumes look so familiar - my son dressed up as SD in 2002. So cute. Isn't great to being able to look back on old photos. They are adorable.. I love those robot costume. What priceless photos! I used to make all my son's costumes and really enjoyed it. Now I have the pleasure of seeing my grandsons in their costumes. AND I absolutely love the photos from 2010. The entire group looks wonderful! Thanks for sharing! Aww. How fun. Love the themes. We had a theme last year but not this year. 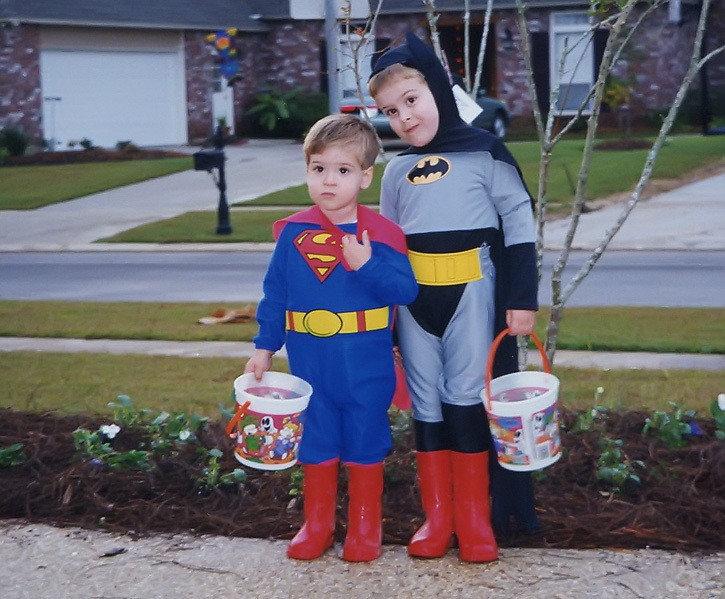 Oh my goodness, they are adorable each and every year but those red boots for Batman and Superman rock! Those are great! And you did great on the robots. I don't have a child trick or treating anymore either. My grandson did of course, but I can't always make it there. Thanks for comment on my photos of Avery Island. Make sure to visit, it's a drive though. I enjoy it each time I go. But bring bug spray, the mosquito's get bad. Oh my, these are just precious! What sweet sweet memories. Alex looks so much like you when he was little. They are such cute guys! One day I hope to do what you've done. Hopefully in this lifetime. You'll be so happy you did this when you're planning their senior year and wedding. Don't mean to rush things! Your guys had the cutest costumes! JDaniel would love to have been robots with them. These are so sweet! Precious moment for your son. Lovely picture memories! i love homemade costumes so much! you can see the love and time put into them. how great!